I find myself, happily, with a whole salmon sitting in my fridge. My usual, more frugal, self would fillet, portion and freeze the fish for quick mid week meals probably making a few gluten-free salmon fish fingers too. Today though, I am going to buck the trend and cure the fillet to serve on Christmas Day with buckwheat blini and rose champagne (that is the only way to start Christmas Day in our house). This dish takes around 48 hours to cure and during that time you do need to turn the fish over morning and evening to get an even cure. But apart from that it is one of the easiest and most impressive 'home-made' dishes that you can serve, so have a go and lap up the praise when you serve this. And, if you area really sensible, you will buy your salmon already filleted! I have used 2 different cures, one for each fillet. The first was a very simple sugar/salt mix (using the quantities listed in the recipe but omitting the other flavourings). I rubbed this fillet with gin to help the cure to penetrate, this gave the salmon a faint hint of juniper which is just delicious. The intention with the second fillet was to cure it with dill in the style of gravad-lax but I couldn't find a single sprig in my local stores. The gods of invention have obviously been looking after me so I have substituted dill for slivers of fresh fennel and some strongly-flavoured fennel vodka which has been sitting in my cupboard infusing. In case that sounds weird, 3 months ago I stuck handfuls of several different spices and flowers in sterilised jam jars of vodka. There is quite a random selection, as well as fennel there is coriander seed, hibiscus flower, lavender and several others. I wasn't quite sure what I was doing at the time - but obviously I was being foresighted and planning for Christmas! You will get messy filleting and pin-boning the salmon before annointing it with the curing mixture, but that is all part of the fun. I prefer a slightly sweet cure so have used a little more sugar than some recipes suggest. 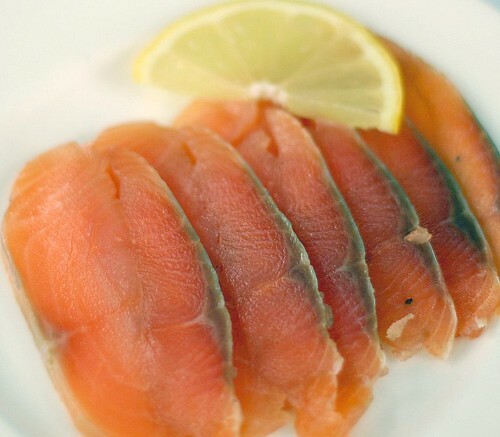 You can freeze the salmon after it has been cured and rinsed off. I did this and layered some fresh dill in between the fillets before freezing. It is much easier to slice thinly from frozen and you get a thin vivid green layer in the middle which is pretty too. 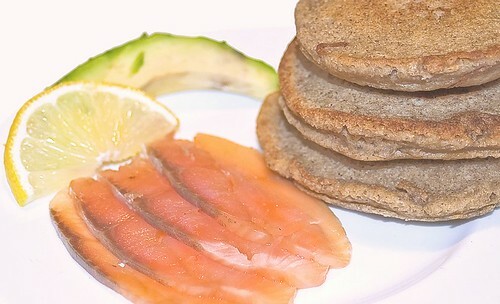 Serve the salmon on homemade buckwheat blini (recipe here) with some soured cream or sliced avocado, delicious! After 48 hrs, remove the salmon from the fridge and unwrap. Wipe each fillet to remove the cure and rinse thoroughly to remove the last traces of any salt. Sandwich the fillets together again and wrap tightly in clingfilm. If you have time, freeze this until an hour before you want to serve this, otherwise chill it. Remove from the freezer or fridge an hour before you are serving it, unwrap and slice finely across the grain to create thin slices. Serve with blini and chilled vodka or champagne. Isn't it great when a plan comes together! This looks divine, might have to try this. Looks fabulous.. and that is something I have never tried to do before. I'm with Janice, on this... I am going to give it a go! I'm glad you like the look of this - do have a go at this recipe. 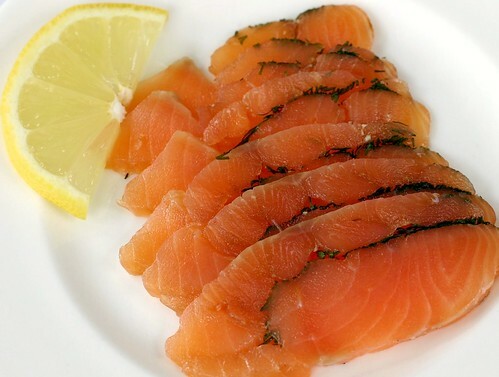 Even if you don't need salmon at present you can freeze the cured rinsed fillets for 3 months, which will make them just about ready for Easter this year! Serve them with blini (http://katethebake.blogspot.com/2009/12/buckwheat-blini-gluten-free.html) and enjoy! Wow...you cured the salmon yourself! That's brilliant! I think I'll just bring the whole salmon & look for you to help me do it...haha.